OliveTree Software had their iPhone BibleReader app updated for the iPad well in advance of the iPad's April 3 launch day. Then, for some inexplicable reason, at the last minute, Apple flagged BibleReader and did not give it approval. This was a big disappointment for me and a lot of users who were looking forward to BibleReader on the iPad immediately when we got our iPads. Many of us checked multiple times a day, assuming that any moment Apple would give the green light. Greek LXX & Hebrew Bible side by side. Note popup with English gloss and parsing information. Notepad icons next to Gen 1:1 represent personal notes.In the end, it took over a month for the iPad BibleReader to get the go-ahead from Apple. Why they took so long, I have no idea. OliveTree's been making Bible software for quite a long time, so by now BibleReader is quite mature, feature-wise (I was even using it way back when on Palm devices). The iPad BibleReader app has an in-app store for purchases of new biblical texts, commentaries and other add-ons which at this moment even Amazon's Kindle app for the iPad doesn't offer. This makes it convenient for adding texts without having to go to OliveTree's website, but it also makes me wonder if this level of sophistication wasn't also part of the holdup from Apple. 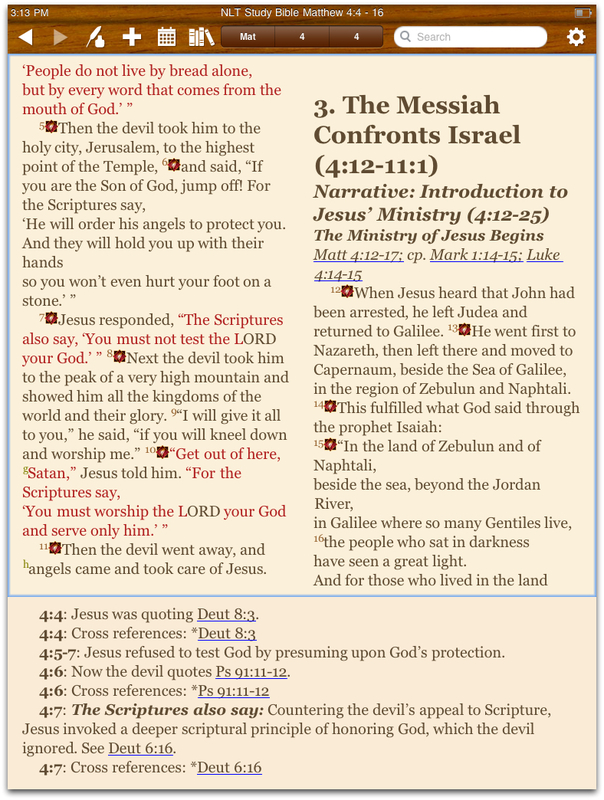 The NLT Study Bible adapted for the iPad. Study notes can either be viewed in a separate pane at the bottom of the screen or by clicking on NLT logo icons within the text.Regardless, it's out now and none too soon. Next week, I'll have a full review of BibleReader for the iPad in the same vein of the two iPad Bible apps I've already reviewed on This Lamp. I can tell you right now, though: if you could only have one Bible app on your iPad, you'd want to make it OliveTree's BibleReader. It's that great. Thank you for writing about Bible applications for the iPad! We have a new app out called Bible Trivia HD, a version of our long-standing Bible Trivia game, totally rewritten to take advantage of the iPad and its larger screen. We have worked hard to create tough, involving questions and a luxurious ambiance for the application, and we think you will enjoy playing it. If you will drop me an email at the address I gave when entering this comment, I would be delighted to issue a promo code to give you the app at no charge for a review. Please put "thislamp.com" in the subject line because I get a lot of spam emails and want to make sure I catch yours. PS I looked for an email address to send this to and could not find one. I also checked your guidelines and believe that a respectful message promoting an application likely to be of interest to you and readers of your blog is appropriate. If this is in error, please accept my apologies. Agreed on all counts, Martin.